The EU REPARIS Accountancy Education Benchmarking Study gives the participating institutions clear information on their educational provision and how it compares to international expectations. 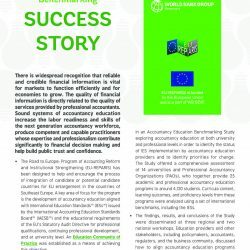 A number of good practices in accountancy education emerged from the Study, including some unique insights into how often resource constrained institutions have innovated in order to implement International Education Standards. Benchmarking allows accountancy education providers worldwide an opportunity to better understand and target educational reforms, bringing benefits to diverse stakeholders including students, universities, employers, Professional Accountancy Organizations, accreditation bodies and policymakers.